ThirtySevenWest 41 - Creative ideas about personalized custom ribbons, woven tags and labels, personalized gifts and more!!! ThirtySevenWest - Creative ideas about personalized custom ribbons, woven tags and labels, personalized gifts and more!!! Tara Tetreault and Candice Connors, the duo powerhouse hailing from Northampton, Massachusetts, are the subject of our first feature on blog.thirtysevenwest.com. We love what they’re doing, think they have a stunning product line at their store, Jackson & Connor, and we’re thrilled that we’ve had the opportunity to do work for them. Part of the interest in interviewing Tetreault and Connors was also to showcase the success of two women who ventured out into a seemingly daunting project in early 2008 and are now becoming a household name in New England. Beth: It’s a really neat story of how you both came to know each other, and eventually co-own the store. What prompted you to venture into business together and leave your respective jobs? 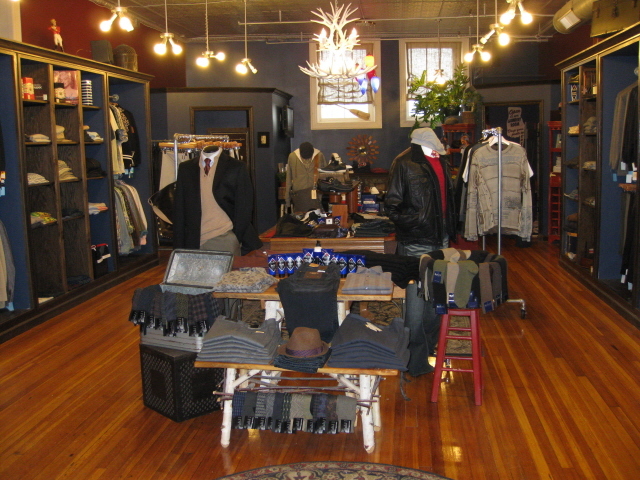 Tara: It had always been a dream of ours to own a store separately. It was nice to find Candice again while she was at Yale and I was a Rep. It sort of came together after I lost my job and couldn’t find another one. I decided to go for it but I did not want to do it alone and that’s when I began to hard sell Candice. Yale Genton was closing so it made sense for her to try something new with me. B: How did working in New York change your perception of men’s wear and influence what you’ve done in Jackson & Connor? T: It was great to have a view from the otherside of the biz. 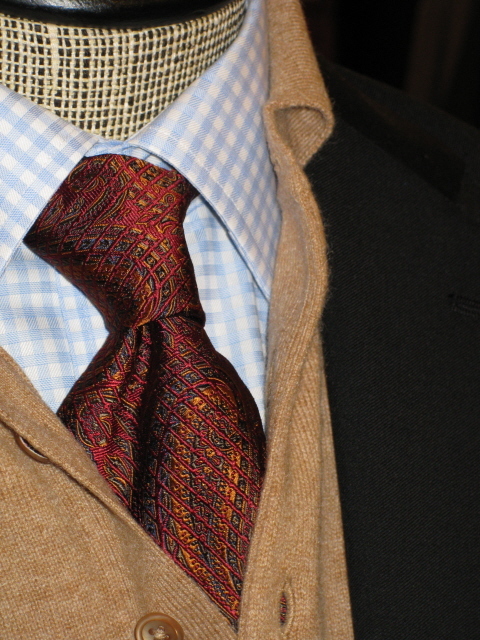 It was great to have the entire East Coast as my territory because it gave me a chance to see a lot of the speciality men’s apparel stores that are out there. It is so great to see how different each one is and their interpretations of men’s apparel. B: Coming up on your two year anniversary of opening the store, what have been two of your best moments in business so far (victories, large or small)? 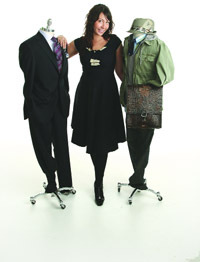 T: One of my best was winning an award called 40 under 40 put out by BusinessWest Publication in Springfield, MA. They choose from the areas under 40 population and pick 40 who are really moving and shaking out here. It was quite an honor to be chosen especially after only being open for less than a year. Being a part of the community serving on boards and committees to make this a better place is a huge victory for ourselves and the town. B: Since Northampton is a small town and you both had history there, did you feel more comfortable opening Jackson & Connor there, or more nervous considering you were essentially replacing Taylor Men? 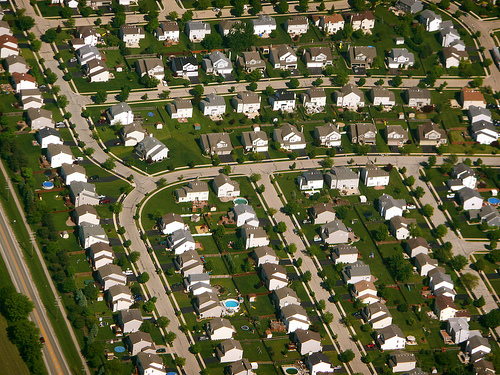 T: Way more comfortable, this is my home and we had a good base from here to start a business. B: You’ve outlined styling for a Jackson and a Connor, but what inspirations do you draw from to continue building on your styling choices for the men of Northampton and its visitors? T: Nature, magazines, fashion blogs, the locals, the celebs. B: What have you found to be your most valuable resource, other than customers, for creating a successful and happy business? T: Being a part of the community. Putting yourself out there for people to get to know you. B: What can we expect from Jackson & Connor in the next few years? T: More greatness. More selection. Perhaps a different location. Perhaps a shoe store. Perhaps a women’s store. WHO KNOWS!!! Great thanks to Tara from Jackson & Connor for taking the time to answer our questions and give us some insight into her and Candice’s store. Please check out the latest from them here and also on Facebook, here. Today’s post is about meat. And vegetables. And dairy. And eating… but before you can eat, you must make. I found Food in Jars last week and it was one of those experiences where I wish I hadn’t in a way, because now I know better about the process of canning (i.e. more responsibility to the food and myself.. and no excuses!). But on the other hand, I was ecstatic because now I know better about the process of canning. Catch 22? Marisa, the writer/ photographer/ canner extraordinaire behind Food in Jars, has been breaking down the canning process on her blog and even teaching classes in the Philly area (if you’re up there, check her out). 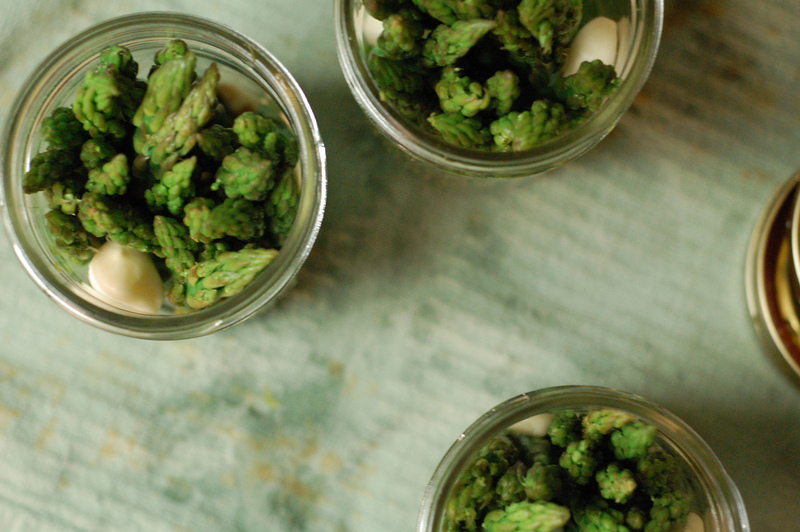 When I found her recipe/ instructions on how to pickle Asparagus, I couldn’t resist but share it with you. It’s not rocket science, I assure you. 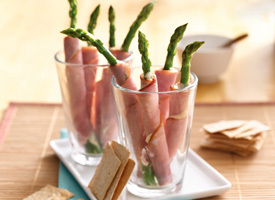 And I encourage you to give it a shot because if you do, you can make this: ham, cream cheese, and asparagus wraps. 1. Take a slice of ham. It can be deli ham, but it’s better if you have something like a 1/4″ slice of spiral ham. 2. Take cream cheese (and a knife) and spread it on the ham. How much? Whatever you prefer. 3. Take a pickled asparagus spear (or two or three) and place at one end of the ham slice. 4. Roll the ham slice from one end to the other, with the cream cheese and asparagus inside. 5. EAT. Then repeat process a minimum of three times. Seriously. I’ve known this recipe for years, and there are many different takes on it. You can find people using prosciutto instead of ham here, or even substituting cream cheese for dill sauce here. Either way, it’s easy and delicious. Did you know that broccoli travels for about 7 to 10 days before reaching your local grocery store? That means that half of your broccoli’s life is already gone when you take it home. If it sits in your refrigerator for a few more days, there’s a good possibility that by the time you want to make stir fry, you may need a new head of broccoli. And if you live in Iowa, for example, chances are the tomatoes you’re buying in December are not coming from the surrounding area. What does that mean? Extra travel time, of course. Beyond the mere problem of wasting food, buying produce takes on a whole new meaning when you really look at where your produce is grown. This affects things like supporting local farmers, reducing energy spent in food transportation, and enjoying fresher foods. What does this mean for you? It means that maybe you should buy corn from the farm down the road this summer, guaranteeing that you are getting absolute freshness and supporting a local farmer. My father would drive 45 minutes for corn from “the farm.” I’m serious, I don’t even know the name of the place… we just call it the farm. It always trumped store bought corn and thanks to local patrons, the farm continues today. And it means that you may have to become more choosy about what you’re eating throughout the year in an attempt to eat the best produce available. So if you live in Georgia you can enjoy lush, local blueberries in the summer, adding them to your favorite cereal, breads, and smoothies. But know that enjoying them in November means they’ve done some traveling. 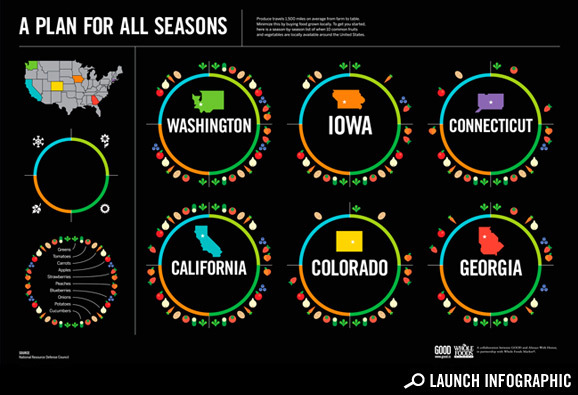 The folks at Good partnered with Always With Honor and created a neat infographic showing us “A season-by-season list of when 10 common fruits and vegetables are locally available around the United States.” Check it out here and find another equally interesting infographic about food travel distances here. Well, I’m not surprised to say that Martha Stewart and gang have outdone themselves again! There will be tons of recipes in this post to cover a broad range of palettes, from fancier get-togethers to backyard simplicity still bursting with flavor. These recipes are from blogs and sites that I adore, and trust with all my culinary endeavors. Good luck! These recipes are the perfect complement to warm summer days and good friends and family gathering around for special occasions. 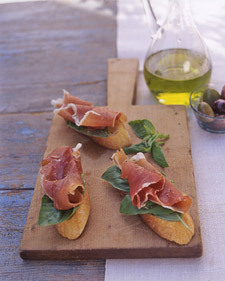 Prosciutto-Basil Crostinis. I’ve made my fair share of crostinis, and they’ve all been more difficult than this recipe appears to be. The prosciutto and basil combination alone should make your mouth water. Crostinis are also great with combinations like roma tomatoes and buffalo mozzarella, brie and apple, goat cheese and olive tapenade, and the combinations go on for days. Shrimp Cocktails. These are not rocket science. Really, I promise. But they are easy, a great cold appetizer, and of course, perfect as a finger food. You can pair the shrimp with a traditional cocktail sauce, or infuse it with other ingredients, like mango or jalapenos, to make it standout. Or for a savory, grilled version of shrimp, try Emeril’s Lemon-Herb Grilled Shrimp. Try your hand at an Arugula Salad with Strawberries and Pecans from Ezra Pound Cake. She (yes, “she” not “he”… her name is Rebecca, actually) has a really neat story behind her blog and her recipes have never steered me wrong. 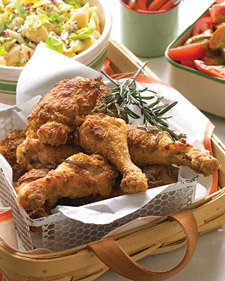 And to round it up, this Rosemary Fried Chicken from Martha Stewart is a slight twist on a classic favorite for any summer get-together. I hope for those of you who are celebrating big with graduations (or maybe just little, personal picnics and fun), have a wonderful weekend!